I had to google the name! Amazing that it would be on your garden wall. But at least you're well protected against Evil! Protected against lust for sure! 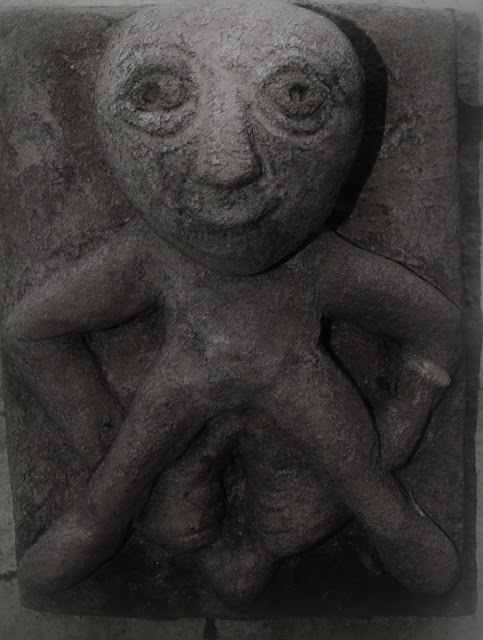 Oh, I love the mysterious Sheela na Gigs! This looks rather friendly compared to some others I've seen. It was P J Harvey's song that introduced me to them. Great song, that one. Shirl got it for a joke. I'm glad she did! Not sure I get the mystery part, but impressive nevertheless. And photos are cool, too. THanks. The thinking is that they are a christian thing meant to display list in all its evil! I was under the impression that the meaning/origin of them is debatable. To me they look like the dark side of the feminine, the obverse to the Virgin Mary. Kali is fearsome but she is mother/destroyer. Ok by me, you have to break an egg to make an omlette.